Discuss the benefits of natural light and how it can be maximized and controlled to enhance the personal comfort of the building occupants. Explain how energy can be conserved through the proper specification of automated shades in order to raise the sustainability profile of the building. Describe how a shade is motorized, and identify the different motorization options along with the controls and building integration possibilities that create an environmentally friendly solution. Discuss the importance of fabric in specifying shades that maximize daylight, minimize glare and are green building solutions with particular reference to openness and color. In today’s world of rising energy costs, it is important to keep a handle on a building’s energy consumption. One of the easiest ways to do this is by using the sun’s natural light. The sun provides a building with free light and keeps it warm, and many studies have found that the sun’s natural light produces beneficial effects on building occupants. At the same time, however, sunlight can overrun a facility, causing problems such as high energy costs for constant air conditioning, eyestrain from glare on computers, hot spots in the building, and lethargy in employees. To keep out heat and glare while still maintaining a view for people inside the building, window shades are a first line of defense. But there are shades, and there are shades. With the large amounts of glazing in today’s buildings, the solar shading industry has increased its offerings to effectively control daylight and reduce solar heat gain. Some of the most efficient solar control options are motorized window shades, which can automatically adjust to compensate for the changing shade requirements throughout the day, adding to occupant comfort as well as building energy performance. Automated shades react silently to the ever-changing nature of daylight, without the need for manual operation, to prevent glare and allow maximum usable daylight. This article will provide an overview of the benefits of designing a space with ample views and daylight, the challenges this presents, and how motorized shading can help solve these issues. Under discussion will be the benefits of natural light, the importance of shade fabric selection, and the different motorization options, as well as the right time in the design process to discuss these issues. The proper definition of daylighting—the harvesting of natural light—and its benefits are well known. Many studies, including groundbreaking research from the Hershong Mahone Group, have been conducted and the results are all very similar: natural light and connection to the outdoors via window views improve people’s mood and their general well being, they boost recovery rates in hospital patients and the test scores of students and, perhaps most important to building and company owners, they increase productivity and reduce the number of employee sick days. Operational performance increases, too, with often significant reductions in artificial light and HVAC usage. With commercial buildings representing just under one-fifth of U.S. energy consumption, and office space, retail space, and educational facilities constituting half of commercial sector energy consumption, reductions in building energy usage can add up to some pretty significant savings both in dollar amounts and greenhouse gas emissions. Owners and architects in virtually every building sector have joined the push to maximize natural daylight. A recent article titled “Best and Brightest” in United Airlines Hemisphere’s Magazine stated that some companies including major aerospace engineering firms maintain they have won billions of dollars in additional contracts by incorporating more natural light into their workspaces. Photo courtesy of Draper, Inc. Indiana University-Purdue University Campus Center. Indianapolis, IN. Photographer: Tony Frederick, Muncie, IN. Glare control is perhaps the most common failure in daylighting. Shades play a crucial role in helping a facility reach daylighting autonomy, that is, the minimum use of artificial light, and the maximum use of natural light without being overcome by glare. When a person experiences glare coming in from a window directly in their face or on their computer screen, work performance can be adversely affected. Glare control, defined as improving visual comfort by blocking direct sun views while reducing brightness and contrast to manageable levels, in fact, can be a significant factor in daylighting strategies. If not controlled properly, glare can also affect interior lighting quality. The U.S. Green Building Council’s Leadership in Energy and Environmental Design (LEED) Reference Guide notes in IEQ for Daylight, there are “acceptable and unacceptable forms of glare control devices. The major attribute all acceptable forms have is operability.” Absent a properly designed glare control strategy, a daylighting program is doomed to failure. 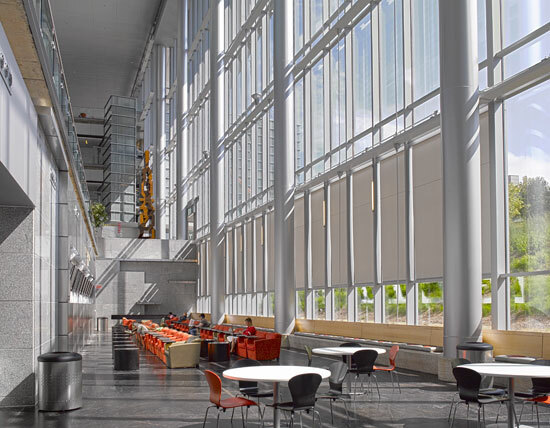 For reference in terms of designing for daylighting, architects should consult the Illuminating Engineering Society of North America (IESNA), which has been the reigning authority and has published Recommended Practice for Daylighting Buildings. This document serves to guide professionals through different design options and includes the latest data and technological solutions for meeting the challenges of daylighting while maximizing its benefits. Included is detailed information on design techniques, delivery methods, glazing systems, shading techniques, control strategies, and daylight performance simulation tools. Shading systems are very useful as daylight management solutions that can mitigate both glare and heat gain while maximizing usable daylight in a building. Controllability of those shades is a key issue and can influence the achievable level of daylight autonomy. Shades can be either manual or automated and while they can both be fashioned from the same fabric, and similarly positioned, the manually operated shade will always be moved at the discretion of the building occupants. Industry studies have shown that, frequently, manual shades are only moved once or twice a day, if at all. Occupants have been known to be quick to lower a shade in the face of bright glare, but are not always as fast to raise it again when the glare situation has given way to more diffuse light. In some cases the shade is left drawn for extended periods, thus depriving the space of the human and operational benefits of subsequent daylight cycles.